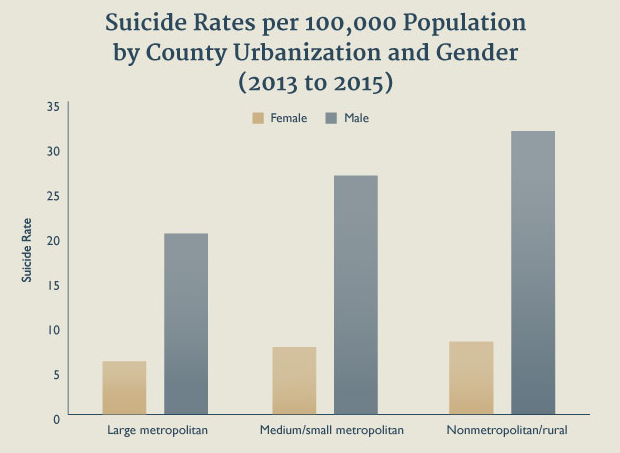 Though most suicides occur in urban areas, rural suicide rates have remained high over the past decade and are increasing faster than rates in all sizes of metropolitan counties, according to analysis of data analyzed by the Centers for Disease Control and Prevention. One reason: Rural residents have less access to mental health care, underscoring the need for more treatment resources in those areas. The online program for a master's degree in social work at the University of Southern California broke the data down into a host of easily digestible graphics. Click here to see them. University of Southern California graphic; click on the image to enlarge it.